Plastic Bottles and Dippers There are 9 products. Fieldmaster® Collapsible Mosquito Dipper: This dipper has an aluminum telescoping handle with a white plastic 4.5" diameter, 2" deep bowl. With it's comfortable vinyl grip handle, it provides ease of use because it extends from 25" to 46". The dipper has pour spouts and graduations. Small, round “sample” bottle. Polyethylene, 125ml. 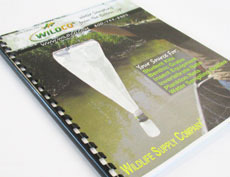 Also used for all Fieldmaster® Nets and Turtox® Tow Nets as collection bottle. Click here for pack of 12 (3-7900-C25). 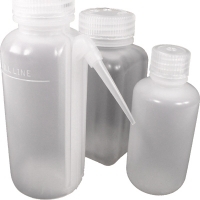 Bottle,Wash LDPE Unitary 250mL. 2.25 x 2.25 x 5.5". 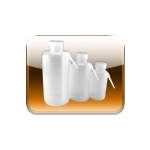 Bottle,Wash LDPE Unitary 500mL. 3 x 3 x 7". One-piece “wash” bottle with spout At Wildlife Supply, you can order just one of these durable Nalgene® plastic bottles - and at the same low price. As a manufacturer, we know the inconvenience of choking on case lots. Here’s a situation where one size does not fit all. 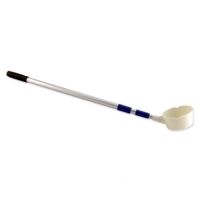 Wash bottle with spout: Ideal for rinsing down nets in the field or sieves in the lab sink. Their one-piece construction allows rinsing at an angle. Constructed of polyethylene. Bottle,Wash LDPE Round 1000mL. 3.5 x 3.5 x 8". Bottle, Widemouth PP Square 250mL. 2.25 x 2.25 x 4.5".